Fit Foodie Megha: Plan New Year's Dinner at Hyatt Regency! Planning for a cozy dinner on New Year's eve? 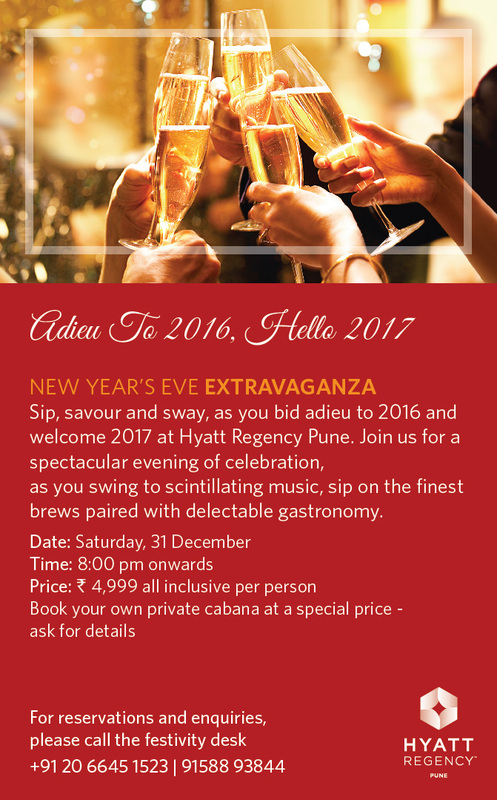 Sip, savor and sway, as you bid adieu to 2016 and welcome 2017 at Hyatt Regency Pune. Join them for a spectacular evening of celebration, as you swing to scintillating music, sip on the finest brews paired with delectable gastronomy. Celebrate New Year’s evening that brings the world to your platter with regional Indian and International fare spread across the indoors and outdoors of our multi cuisine dining venue, The Café. Paired with a variety of premium spirits and access to our fun filled party zone at Single Malt & Co.
Savor a true Italian spread at our Trattoria with a delicious selection of antipasti, zuppa, salumeria, artisanal pasta’s, wood fired pizzas and dolce. Paired with a variety of premium spirits and access to our fun filled party zone at Single Malt & Co.
* Early Bird offer valid for bookings made from 15 to 27 December.